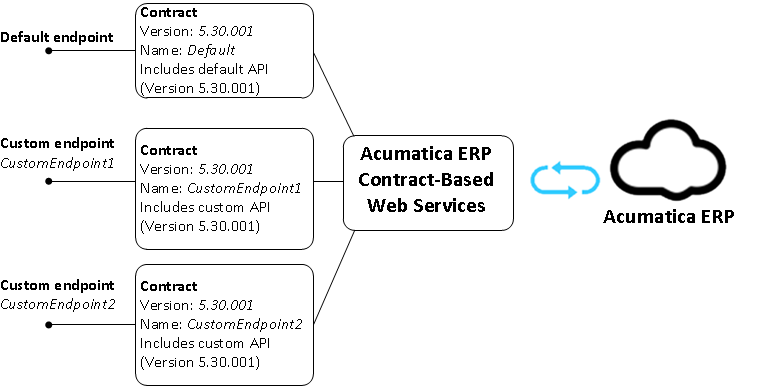 Today I want to speak with you about new Contract-Based Web Services API that you can use in Acumatica 5.3 version. 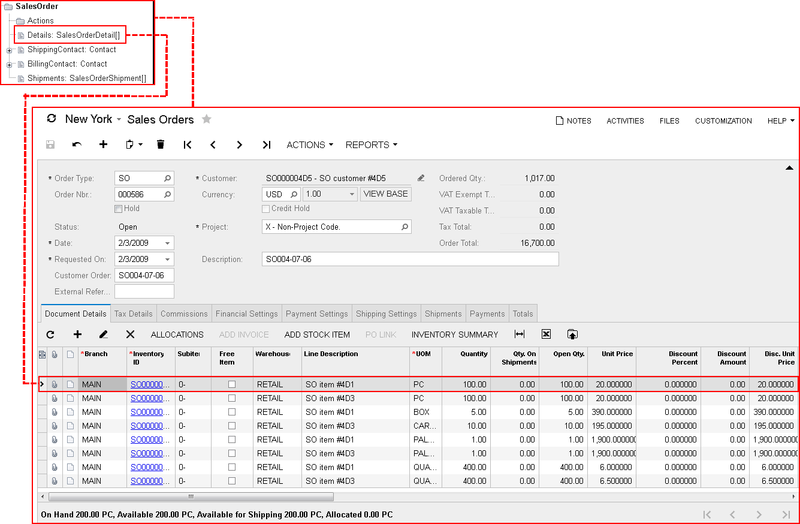 Previously you had to use names of fields and actions right from Acumatica UI. And if we rename or move field your code will stop working. Now new API has an intermediate layer between Acumatica UI and the integration code, so can be sure that most of minor changes in Acumatica code will not break existing integration. New API is easier to use. You need less lines to complete the same task. Also it is more intuitive, so it will easier for you to write a code. The current API just isn’t well adapted to REST. But now you can feel very strong industry trend toward to REST. You can configure new one in Acumatica user interface. (Fast and flexible, but requires support). Endpoint contains screens, linked/detail contains, field and actions. All these items has names that will be expanded through web services. On the other side all these items connected with Acumatica user interface elements. When everything required is mapped you can start to use web service. In this example i will show you how to use Stock Items thought API. For my task it is enough to use default endpoint, so i will use it. If you click on “View Endpoint Service” you will see web services definition with all possible methods. The main thing that you need at this point of time is URL of web service. You will use this url in Visual Studio (Or other environment) to import web service definition. And the last preparation step – do not forget to enable cookies and increase request limit. Now we can start development. The classic web services API is not going anywhere and will remain supported. But it is better to built all new projects on the new contract-based web services API – sometimes next year it will become mandatory for solution certification. Existing code can be migrated gradually; you can mix both technologies in the same product (You can share session cookies to avoid needing multiple logins). – use Screen Based API. For the contract-based web-services API, what would you suggest in-terms of helper / stub classes for PHP. Hello. Thank you for your blog. Would you mind doing a blog that explains how to setup your endpoints (I am trying to automate some Vendor reads and adds) for Acumatica 5.0? As in many other systems, when it comes to huge amount of data, you need to use different approach and limit number of records you can export. With ReturnBehavior set to OnlySystem or OnlySpecified you can also define what parts of an entity should be exported. After you export IDs and keys in batches, record-specific data can be further requested with the Get method. I got an error such as Value cannot be null : Parameter name:model. Hi Pebrindanow. Sorry for late reply. Could you please give more details on where you get this error? I got it, I skipped adding AllowCookies to the config file. Any way to force linked entities to load? Also I recommend to get keys only first and than request record by record. with keys and Get method. I hope you’re doing well. I’m using contract-based SOAP APIs to try to import about 25,000 Journal Entry lines from a banking system into a single Acumatica GL batch. If I add all the records at once, my request times out after a few hours. Is there a faster/better way to do this? I looked into multi-threading to import the data into several smaller GL-batches and that works, but it still takes over an hour to run. Also, the customer does not accept that multi-threading approach; they want all their daily data in a single GL batch. Also, 25,000 records does not seem like a lot to me, so I wonder if Acumatica’s APIs were not built for this volume of lines in a single transaction. All I’m doing in my code is building the entity info by reading a text file and then calling the put method to create the GL batch using that entity with 25,000 records. Your linked helped a lot. I’m able to upload records much faster this way. Having said that, When I try to change the header data for the GL Batch, Acumatica does not update the CuryID field properly. The rest of the header fields such as DateEntered, Hold, BranchID, and Description all allow me to updated them with no issues, so the issue is isolated to the CuryID field only. Is this a bug or by design? For the import in question, we need to create multiple GL Batches (one per currency), so we need to be able update the CuryID as needed (I hardcoded it to “CAD” for the example below). Please provide some input as to why CuryID cannot be updated properly. I Recommend you to follow same sequence as you do in the UI. That worked beautifully. Now all I have left is a simple question for sake of clarity. Can you clarify why we need to run the update method for some fields and not others? Because even the code you provided in your post “https://asiablog.acumatica.com/2016/03/simple-data-import-test.html” for adding GLTran lines works well only adding the update method once for all fields and not after every single field. When you say “For example when you choose Date, Acumatica updates PostingPeriod. This is beacuse Date has commit changes flag. ” My assumption is that the update method is needed for fields with the commit changes flag = true, correct? I’m just trying to understand when to apply and when not to apply the update method now. Thanks again for all your help; you’re a great resource. As I explained, when you work thought code you need to emulate user behavior. So when user change the field you need to trigger business logic. However it is not for all fields because not all UI fields trigger business logic by themselves. Only fields where CommitChanges=true. So fields that generates callbacks from browser to server need to be updated in the separate update request in the code. //here I get a handle to graph extension GLTranExt to be able to update the added fields. As when you insert row it may have a different key. You were right, that was the problem. Custom fields are now being updated successfully. I will keep the sequence in mind for any future development. Again, you’re a great source of knowledge and your help is greatly appreciated.